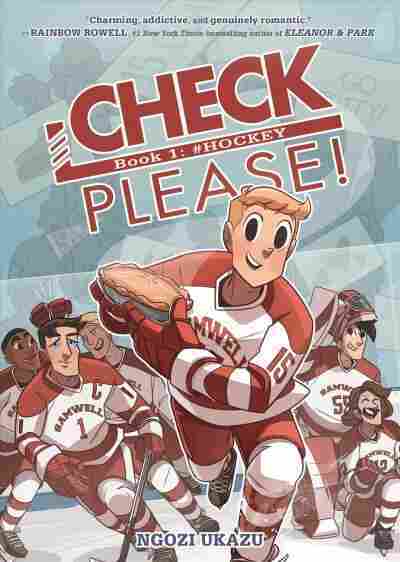 Life, Love and Hockey (Oooh, And Pie) In 'Check, Please!' Ngozi Ukazu's charming, cheerful webcomic about a gay college hockey player has been collected in book form. Check, Please! stays squarely on the bright side of life, a brave choice in its own way. Check, Please! is a soap bubble. Ngozi Ukazu's comic levitates and drifts insouciantly, belying the massive forces of temperature and pressure that must be held in balance for it to exist. Its story of a college hockey team isn't particularly gripping or dramatic, though there are many flashes of joy. But its quality of suspended animation — of a moment preserved in quivering perfection — gives this comic a tension, and thus an interest, more compelling than its happy-go-lucky façade suggests. The moment it preserves is partly cultural. Check, Please! is very much a thing of our time in its approach to gay identity and romance. Protagonist and narrator Eric "Bitty" Bittle, a gay college freshman, is comfortable in his skin in a way that was impossible to imagine just a few years ago. Even though the onetime figure-skating champion has found himself on a hockey team, he doesn't feel the need to put up a macho front to blend in. (Not that he'd have much luck if he did; Ukazu has made him about 5'4", with a turned-up nose and eyes like dinner plates.) Bitty bakes pies, sings Beyoncé in the shower and says things like, "Goodness gracious!" And his teammates are fine with that. There's no big coming-out scene, no "convert the lone homophobe" drama, no storyline cooked up just to educate the reader about the gay experience. Bitty doesn't need any of that, and Ukazu gives the reader credit for not needing it either. Bitty also doesn't talk much about his feelings for his stalwart team captain, Jack. In fact, for much of the book you'd be hard pressed to know those feelings exist at all. When Bitty talks to readers via his vlog, he sticks to hockey practices, games and social life with the team. Only once does he give in and voice what he knows readers are wondering about. "For a while, some of you have been asking about my love life ... I've never had much of a love life," he says. "But I will say this ... Never fall for a straight boy." You'd hardly know he'd done so, up to that point and after it. When romance finally takes center stage at the very end of the book, it seems to come out of nowhere — that's how cagy Ukazu is about it. There's a quaintness to Ukazu's approach, but because this is a gay teen romance, it has an edge. The fact is, if Bitty were female, her tale would be utterly banal — a 1950s-style exercise in chaste daydreams, unspoken urges and happy endings. But because both writer and reader know the dark realities that — despite all recent progress — gay kids face, Bitty's story has context and portent. Ukazu could have overtly addressed issues like the suicide rate among gay teens. (LGB youth are almost five times as likely to have attempted suicide compared to heterosexual youth, according to suicide prevention organization The Trevor Project.) But by crafting a glowing, antiseptic bubble for her hero to fall in love inside, she's making a political and artistic choice that's brave in its own way. There's a quaintness to Ukazu's approach, but because this is a gay teen romance, it has an edge. It's also convenient. Ukazu is much better at depicting life's ups than its downs; Bitty's world is, indeed, a bitty world. While bad things happen once in a while, they aren't that affecting. Check, Please! started as a webcomic, and you can tell — every episode feels like a little pop of sweetness to get desk jockeys through the 3 p.m. trough. In this case, though, sweetness is much appreciated. Ukazu's art is punchy, assertive and deft. Her style is a bit Disney, true, but she's got pleasing idiosyncrasies. It's fun to watch Bitty grow up from a freshman into a sophomore, though you might feel a pang when he cuts his hair. With Bitty's ever-contagious optimism and Ukazu's sprightly drawings, life inside this soap bubble is as nice as it should be everywhere else.